Prion (IPA: [ˈpriːɒn]; 'prē,än; "pree-on") is short for proteinaceous infectious particle that lacks nucleic acid (analogous to virion, a single infectious viral particule) and is a type of infectious agent made only of protein. At the most basic level, the lack of nucleic acids distinguishes prions from viruses (genetic material contained within a protective protein shell) and viroids (nucleotides of RNA without protein coat). The functionality of a protein is dependent upon its ability to fold into a precise three-dimensional shape. Revealing the complexity and harmony of the universe, proteins rapidly fold into the correct shape despite the innumerable possible configurations. It is believed that prions disrupt this harmony and cause disease by refolding abnormally and converting normal proteins into their configuration. Prion diseases are transmissible neurodegenerative conditions that affect the brain and neural tissue of animals and people. Although there is a genetic component to many prion diseases, prion diseases are not exclusively genetic diseases. They are grouped as “transmissible spongiform encephalopathies” (TSEs). Prion diseases include scrapie (a disease of sheep), chronic wasting disease (in deer and elk), variant Creutzfeldt-Jakob disease (vCJD) in humans, and bovine spongiform encephalopathy (BSE or mad cow disease), all caused by similar proteins in different species. Diseases as varied as "fatal familial insomnia" and "kuru" (a laughing death that is translated into “to tremble with fear”) are believed to be associated with prions. All of these disease are untreatable and fatal. Prions are believed to infect and propagate by refolding abnormally into a structure that is able to convert normal molecules of the protein into the abnormally structured form. Prions have the same amino acid makeup as naturally occurring proteins in the body, but essentially become deadly by changing shape, and they can force normal proteins to adopt their configuration. These misfolded proteins can aggregate in toxic clumps and affect the structure of the brain or other neural tissue. They can easily infect the animals because they do not elicit an immune response. They are generally quite resistant to denaturation by protease, heat, radiation, and formalin treatments, although potency or infectivity can be reduced. It should be noted that the same gene is responsible for spongiform encephalopathies that are not known to be transmissible, as well as some non-neurological diseases. Some require a mutation for transmission to occur, and there are respective mutations which can prevent transmission for most of the TSEs. A non-disease function of the prion gene is not known, but is an area of considerable active research. While prion diseases are untreatable and fatal, a vaccine has been developed in mice that may provide insight into providing a vaccine in humans to resist prion infections. Proteins showing prion behavior are also found in some fungi. Some fungal prions may not be associated with any disease. All known prions are believed to infect and propagate by formation of an amyloid fold, in which the protein polymerizes into a fiber with a core consisting of tightly packed beta sheets. Other mechanisms may exist in yet undiscovered infectious protein particles. Radiation biologist Tikvah Alper and physicist J. S. Griffith developed the theory in the 1960s that some transmissible spongiform encephalopathies (TSEs) are caused by an infectious agent made solely of protein. 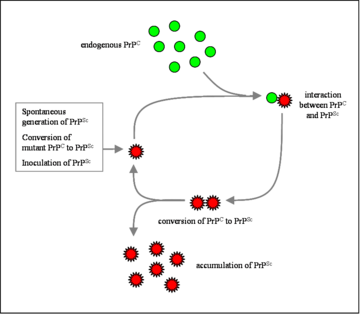 This theory was developed to explain the discovery that the mysterious infectious agent causing the diseases scrapie and Creutzfeldt-Jakob Disease resisted ultraviolet radiation (which breaks down nucleic acids—present in viruses and all living things) yet responded to agents that disrupt proteins. A breakthrough occurred in 1982 when researchers led by Stanley B. Prusiner of the University of California, San Francisco purified infectious material and confirmed that the infectious agent consisted mainly of a specific protein. Prusiner coined the word "prion" as a name for the infectious agent, by combining the first two syllables of the words "proteinaceous" and "infectious." While the infectious agent was named a prion, the specific protein that the prion was made of was named PrP, an abbreviation for "protease-resistant protein." Prusiner received the Nobel Prize in Physiology or Medicine in 1997 for this research. Further research showed that the protein that prions are made of is found throughout the body, even in healthy people and animals. However, the prion protein found in infectious material has a different structure and is resistant to proteases, the enzymes in the body that can normally break down proteins. The normal form of the protein is called PrPC, while the infectious form is called PrPSc—the "C" refers to "cellular" PrP, while the "Sc" refers to "scrapie," the prion disease occurring in sheep. Normal prion protein (common or cellular) is found on the membranes of cells, though its function has not been fully resolved. Since the original hypothesis was proposed, a gene for the normal protein has been isolated, the PRNP gene. Some prion diseases (TSEs) can be inherited, and in all inherited cases there is a mutation in the Prnp gene. Many different Prnp mutations have been identified and it is thought that the mutations somehow make PrPC more likely to spontaneously change into the PrPSc (disease) form. TSEs are the only known diseases that can be sporadic, genetic, or infectious. Although the identity and general properties of prions are now well-understood, the mechanism of prion infection and propagation remains mysterious. It is often assumed that the diseased form directly interacts with the normal form to make it rearrange its structure (enlarge the diagram above for an illustration of this mechanism). One idea, the "Protein X" hypothesis, is that an as-yet unidentified cellular protein (Protein X) enables the conversion of PrPC to PrPSc by bringing a molecule of each of the two together into a complex. The prion hypothesis was initially highly controversial, because it seemed to contradict the so-called "central dogma of modern biology," which asserts that all living organisms use nucleic acids to reproduce. Prior to Alper's insight, all known pathogens (bacteria, viruses, etc.) used nucleic acids for their reproduction. The "protein-only hypothesis"—that a protein structure could reproduce itself in the absence of DNA—was initially met with skepticism and still has critics. Yale University neuropathologist Laura Manuelidis has challenged this explanation for the disease. In January 2007, she and her colleagues published an article in the Proceedings of the National Academy of Science asserting that they've found a virus responsible for the diseases. 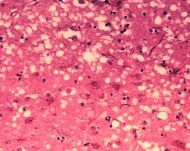 There are four principal disease syndromes associated with prions in humans: Creutzfeld-Jakob Disease (CJD), variant Creutzfeld-Jakob Disease (vCJD), Kuru, and Fatal Familial Insomnia. Of these, only Kuru and vCJD are transmissible, the other two being either heritable or sporadic (i.e., caused by some unknown event, possibly a mutation, that occurs during the life of the affected individual). Kuru and vCJD are known to be transmitted to humans who have eaten the meat or brains of infected animals (or, in the case of Kuru, infected humans). This raises the question: How can prions, which are merely proteins, make their way through the gut and into the brain, where they cause the dreaded "spongiform encephalitis"? Proteins normally are digested down to amino acids in the gut, and transported through the gut epithelium by amino acid transporters. If that was the case for prions, they would no longer be prions by the time they were absorbed through the gut wall, and would no longer be infectious. Some recent research, reviewed by Aguzzi and Heikenwalder (2006), sheds light on this question. First of all, prions resist digestion in the gut. They remain intact proteins and are known to accumulate in the distal ileum. They resist digestion because they are extremely resistant to all forms of degradation. They also resist destruction by high-temperature autoclave and by formaldehyde, and in fact, by most means tested so far. In fact, cases of vCJD have been known to be contracted from properly sterilized surgical instruments. But, even if prions are not digested, they should not be absorbed across the intestinal wall. In fact, they circumvent the normal process of intestinal absorption by passing into the the Gut-Associated Lymphoid Tissue (GALT). Related to this, it seems that chronic inflammation predisposes to prion infectivity, e.g., in rheumatoid arthritis, type-I diabetes, or Crohn’s disease. Prion-like proteins that behave in a similar way to PrP are found naturally in some fungi and non-mammalian animals. A group at the Whitehead Institute has argued that some of the fungal prions are not associated with any disease state and may have a useful role. However, researchers at the National Institutes of Health have also provided strong arguments demonstrating that fungal prions should be considered a diseased state. Research into fungal prions has given strong support to the protein-only hypothesis for mammalian prions, as it has been demonstrated that seeds extracted from cells with the prion state can convert the normal form of the protein into the infectious form in vitro, and in the process, preserve the information corresponding to different strains of the prion state. It has also shed some light on prion domains, which are regions in a protein that promote the conversion. Fungal prions have helped to suggest mechanisms of conversion that may apply to all prions. A great deal of our knowledge of how prions work at a molecular level comes from detailed biochemical analysis of yeast prion proteins. A typical yeast prion protein contains a region (protein domain) with many repeats of the amino acids glutamine (Q) and asparagine (N). These Q/N-rich domains form the core of the prion's structure. Ordinarily, yeast prion domains are flexible and lack a defined structure. When they convert to the prion state, several molecules of a particular protein come together to form a highly structured amyloid fiber. The end of the fiber acts as a template for the free protein molecules, causing the fiber to grow. Small differences in the amino acid sequence of prion-forming regions lead to distinct structural features on the surface of prion fibers. As a result, only free protein molecules that are identical in amino acid sequence to the prion protein can be recruited into the growing fiber. This "specificity" phenomenon may explain why transmission of prion diseases from one species to another, such as from sheep to cows or from cows to humans is a rare event. The mammalian prion proteins do not resemble the prion proteins of yeast in their amino acid sequence. Nonetheless, the basic structural features (formation of amyloid fibers and a highly specific barrier to transmission between species) are shared between mammalian and yeast prions. The prion variant responsible for mad cow disease has the remarkable ability to bypass the species barrier to transmission. There is evidence that prions may have a normal function in maintenance of memories over a long period of time. Maglio and colleagues have shown that mice without the genes for normal cellular prion protein have altered hippocampal Long-term potentiation (LTP). The following diseases are now believed to be caused by prions. ↑ The Oxford American College Dictionary (New York: G. P. Putnam's Sons, 2002). ↑ S. B. Pruisner, "Novel proteinaceous infectious particles cause scrapie," Science 216(4542) (1982): 136–44. Pronunciation is explicitly defined as "pree-on" on page 141, third column. ↑ J. Collinge, "Prion diseases of humans and animals: Their causes and molecular basis," Annu. Rev. Neurosci. 24: 519–50. ↑ New York University Medical Center and School of Medicine, Active vaccine prevents mice from developing prion disease. Science Daily (2005). Retrieved February 6, 2007. ↑ K. Qin, M. O'Donnell, and R. Y. Zhao, "Doppel: More rival than double to prion," Neuroscience 141(1) (2006): 1–8. ↑ T. Alper, W. A. Cramp, D. A. Haig, and M. C. Clarke, "Does the agent of scrapie replicate without nucleic acid?" Nature 214(90) (1967): 764–6. ↑ J. S. Griffith, "Self-replication and scrapie," Nature 215(105) (1967): 1043–4. ↑ S. B. Prusiner, "Novel proteinaceous infectious particles cause scrapie," Science 216(4542) (1982): 136–44. ↑ B. Oesch, D. Westaway, M. Wälchli, M. McKinley, S. Kent, R. Aebersold, R. Barry, P. Tempst, D. Teplow, and L. Hood, "A cellular gene encodes scrapie PrP 27-30 protein," Cell 40(4) (1985): 735–46. PMID 2859120. Retrieved February 26, 2008. ↑ G. Telling, M. Scott, J. Mastrianni, R. Gabizon, M. Torchia, F. Cohen, S. DeArmond, and S. Prusiner, "Prion propagation in mice expressing human and chimeric PrP transgenes implicates the interaction of cellular PrP with another protein," Cell 83(1) (1995): 79–90. PMID 7553876. Retrieved February 26, 2008. ↑ Yale University Office of Public Affairs, Press release (January 29, 2007): Potentially pathogenic virus found in Mad Cow cells. Yale (2007). Retrieved February 2, 2007. ↑ A. Aguzzi and M. Heikenwalder, "Prion diseases: Cannibals and garbage piles," Nature Reviews: Microbiology 4(2007): 765. ↑ J. Shorter J. and S. Lindquist, "Prions as adaptive conduits of memory and inheritance," Nat. Rev. Genet. 6 (2005): 435–50. PMID 15931169. Retrieved February 26, 2008. ↑ L. Maglio, M. Perez, V. Martins, R. Brentani, and O. Ramirez, "Hippocampal synaptic plasticity in mice devoid of cellular prion protein," Brain Res. Mol. Brain Res. 131(1–2) (2004): 58–64. PMID 15530652. Retrieved February 26, 2008. Pan, K. M., M. Baldwin, J. Nguyen, M. Gasset, A. Serban, D. Groth, I. Mehlhorn, Z. Huang, R. J. Fletterick, F. E. Cohen, et al. 1993. Conversion of alpha-helices into beta-sheets features in the formation of scrapie prion protein. Proc. Nat'l. Acad. Sci. USA 90(23): 10962–10966. PMID 7902575. Retrieved February 26, 2008. All links retrieved June 2, 2015. Prion Diseases and the BSE Crisis (1997). Article from Science magazine by Stanley Prusiner. Official Mad Cow Disease Home Page. Science Daily article on transmission of prions through soil. A good overview of prion biology from the Science Creative Quarterly. This page was last modified on 2 June 2015, at 15:17.